Ancient India of the Vedic and Pre-Vedic age was home to some of the most advanced paranormal weaponry ever known. These traditions of paranormal and psyche warfare continued in the later day age of the Navnath Sampradaya and a handful of these Masters possessed the paranormal knowledge to hit and destroy a target at will. The Shabar Mantra given in this post is one such Hindu Tantra, where a Sadhak can shoot and strike down any opponent, rival or enemy soldier using a paranormal Bow infused with a Mantra and a special and fearsome Tantra. 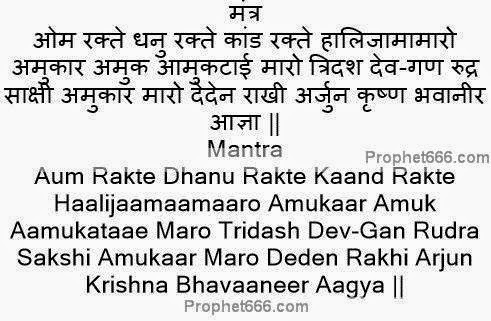 The Shabar Mantra as you will note uses the names of one of India’s greatest warrior from the Mahabharata, Arjuna and his Guru and Guide Shri Krishna. In this post, I have published the Tantra, which was used to prepare and infuse the Bow and the method of shooting down the target. However, I am in no position to vouch for the success or failure of this enemy destruction experiment. The Mantra Experiment has to be started on any of the more suspicious and sacred of the Hindu Tithis or festivals or any kind of Solar or Lunar Eclipse. The Mantra, which is shown in the image, has to be chanted 10,000 times in as few days as possible to be able to Master the Tantra. A Rudraksha Bead Mala should be used to count the number of Mantra Chants. Then to be actually be able to use the experiment on any person, rival or enemy, the following procedure given below has to be followed. The Bamboo which has been used to prepare the Tirdi for the Antyesti [the wooden bed used to carry dead Hindus for their last rites to the crematorium] of a Male Brahmin [Member of the Hindu Priestly Caste] who has died on any Saturday has to be taken to prepare the Bow, using a strong bow string as per the requirement. Then the young one of a Swan has to be sacrificed using the hands by pushing it hard on that portion of the Bow, where the hands of the archer are positioned before actually shooting the arrow. After this, the blood and other residue of the sacrificed young one of the swan, which remains, on the Bow has to be cleaned with Narial Pani [coconut water]. Finally, the archer has to chant the Mantra, replacing the word Amuk-अमुक in the Mantra with the name of the opponent or enemy on whom is going to shoot the arrow and then lastly shoot the arrow in the direction of his enemy.